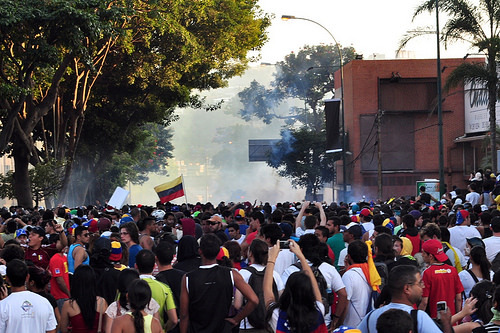 Venezuela protests February 2014 image via aandres/flickr. Creative Commons 2.0 license. If anyone had hoped that the Arab Spring and Occupy protests a few years back were one-off episodes that would soon give way to more stability, they have another thing coming. The hope was that ongoing economic recovery would return to pre-crash levels of growth, alleviating the grievances fueling the fires of civil unrest, stoked by years of recession. But this hasn’t happened. And it won’t. Instead the post-2008 crash era, including 2013 and early 2014, has seen a persistence and proliferation of civil unrest on a scale that has never been seen before in human history. This month alone has seen riots kick-off in Venezuela, Bosnia, Ukraine, Iceland, and Thailand. This is not a coincidence. The riots are of course rooted in common, regressive economic forces playing out across every continent of the planet – but those forces themselves are symptomatic of a deeper, protracted process of global system failure as we transition from the old industrial era of dirty fossil fuels, towards something else. Even before the Arab Spring erupted in Tunisia in December 2010, analysts at the New England Complex Systems Institute warned of the danger of civil unrest due to escalating food prices. If the Food & Agricultural Organisation (FAO) food price index rises above 210, they warned, it could trigger riots across large areas of the world. The pattern is clear. Food price spikes in 2008 coincided with the eruption of social unrest in Tunisia, Egypt, Yemen, Somalia, Cameroon, Mozambique, Sudan, Haiti, and India, among others. In 2011, the price spikes preceded social unrest across the Middle East and North Africa – Egypt, Syria, Iraq, Oman, Saudi Arabia, Bahrain, Libya, Uganda, Mauritania, Algeria, and so on. Last year saw food prices reach their third highest year on record, corresponding to the latest outbreaks of street violence and protests in Argentina, Brazil, Bangladesh, China, Kyrgyzstan, Turkey and elsewhere. But Bar-Yam’s analysis of the causes of the global food crisis don’t go deep enough – he focuses on the impact of farmland being used for biofuels, and excessive financial speculation on food commodities. But these factors barely scratch the surface. The recent cases illustrate not just an explicit link between civil unrest and an increasingly volatile global food system, but also the root of this problem in the increasing unsustainability of our chronic civilisational addiction to fossil fuels. In Ukraine, previous food price shocks have impacted negatively on the country’s grain exports, contributing to intensifying urban poverty in particular. Accelerating levels of domestic inflation are underestimated in official statistics – Ukrainians spend on average as much as 75% on household bills, and more than half their incomes on necessities such as food and non-alcoholic drinks, and as75% on household bills. Similarly, for most of last year, Venezuela suffered from ongoing food shortages driven by policy mismanagement along with 17 year record-high inflation due mostly to rising food prices. While dependence on increasingly expensive food imports plays a role here, at the heart of both countries is a deepening energy crisis. Ukraine is a net energy importer, having peaked in oil and gas production way back in 1976. Despite excitement about domestic shale potential, Ukraine’s oil production has declined by over 60% over the last twenty years driven by both geological challenges and dearth of investment. Currently, about 80% of Ukraine’s oil, and 80% of its gas, is imported from Russia. But over half of Ukraine’s energy consumption is sustained by gas. Russian natural gas prices have nearly quadrupled since 2004. The rocketing energy prices underpin the inflation that is driving excruciating poverty rates for average Ukranians, exacerbating social, ethnic, political and class divisions. The Ukrainian government’s recent decision to dramatically slash Russian gas imports will likely worsen this as alternative cheaper energy sources are in short supply. Hopes that domestic energy sources might save the day are slim – apart from the fact that shale cannot solve the prospect of expensive liquid fuels, nuclear will not help either. A leaked European Bank for Reconstruction and Development (EBRD) report reveals that proposals to loan 300 million Euros to renovate Ukraine’s ageing infrastructure of 15 state-owned nuclear reactors will gradually double already debilitating electricity prices by 2020. In Venezuela, the story is familiar. Previously, the Oil and Gas Journal reported the country’s oil reserves were 99.4 billion barrels. As of 2011, this was revised upwards to a mammoth 211 billion barrels of proven oil reserves, and more recently by the US Geological Survey to a whopping 513 billion barrels. The massive boost came from the discovery of reserves of extra heavy oil in the Orinoco belt. The huge associated costs of production and refining this heavy oil compared to cheaper conventional oil, however, mean the new finds have contributed little to Venezuela’s escalating energy and economic challenges. Venezuela’s oil production peaked around 1999, and has declined by a quarter since then. Its gas production peaked around 2001, and has declined by about a third. Simultaneously, as domestic oil consumption has steadily increased – in fact almost doubling since 1990 – this has eaten further into declining production, resulting in net oil exports plummeting by nearly half since 1996. As oil represents 95% of export earnings and about half of budget revenues, this decline has massively reduced the scope to sustain government social programmes, including critical subsidies. These local conditions are being exacerbated by global structural realities. Record high global food prices impinge on these local conditions and push them over the edge. But the food price hikes, in turn, are symptomatic of a range of overlapping problems. Global agriculture‘s excessive dependence on fossil fuel inputs means food prices are invariably linked to oil price spikes. Naturally, biofuels and food commodity speculation pushes prices up even further – elite financiers alone benefit from this while working people from middle to lower classes bear the brunt. Of course, the elephant in the room is climate change. According to Japanese media, a leaked draft of the UN Intergovernmental Panel on Climate Change‘s (IPCC) second major report warned that while demand for food will rise by 14%, global crop production will drop by 2% per decade due to current levels of global warming, and wreak $1.45 trillion of economic damage by the end of the century. The scenario is based on a projected rise of 2.5 degrees Celsius.